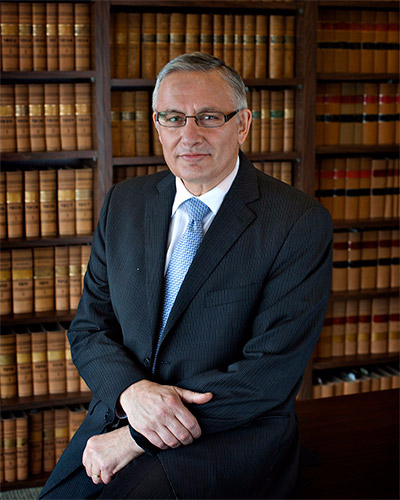 Frank is senior counsel at the firm and has over 40 years of litigation and problem solving experience in the areas of employment, commercial, contract and real estate disputes, administrative and labour law and collaborative family law. He pursued studies at the University of Toronto emphasizing commerce and economics and lectured in the Department of Commerce. Frank graduated from the University of Toronto Law School in 1974. His articles were completed at Madorin, Snyder LLP and he was admitted to the Law Society of Upper Canada in 1976. He finished as a prize winner in the Bar Admission Course. Frank joined Madorin, Snyder LLP as an associate lawyer after his call to the Bar and he became a partner in 1978. Frank utilizes a practical approach to problem solving through negotiations, mediation, collaborative problem solving, conciliation and arbitration. In the event disputes cannot be settled without litigation, Frank appears before various courts and tribunals including the Ontario Superior Court of Justice, Ontario Divisional Court, the Ontario Court of Appeal, the Ontario Labour Relations Board, the Human Rights Tribunal of Ontario, the Tax Court of Canada, and various professional discipline panels. He also acts as counsel to tribunals and for other lawyers and professionals, particularly in the areas of conflict of interest and discipline. In the last number of years, Frank has begun providing arbitration and mediation services for the clients of other law firms, and he is a certified mediator. He has also developed an expertise in collaborative family law and is part of the Collaborative Family Law Association of Waterloo. Frank lectures in his areas of specialty for numerous organizations and publishes legal articles. He is an active member of the Grand Valley Human Resources Professionals Association, Advocates Society, Collaborative Family Law Association of Waterloo, International Academy of Collaborative Professionals, Canadian Bar Association, Waterloo Law Association, and International Commission of Jurists and Law Society of Upper Canada. He was born and raised in Kitchener-Waterloo. His community involvement has included being a director or trustee for the Westmount Golf and Country Club, the Italian Professional and Business Association, K-W Counselling, the Catholic Community Foundation of Waterloo Region, and the Cortina Club.